The Daily Free Pattern Finds will still be placed in my Photo Album Library on Facebook so you can go back and find them there!! I just think it is way more fun to have several Free Patterns a day!! So here is this weeks Facebook Fan Favorite!! 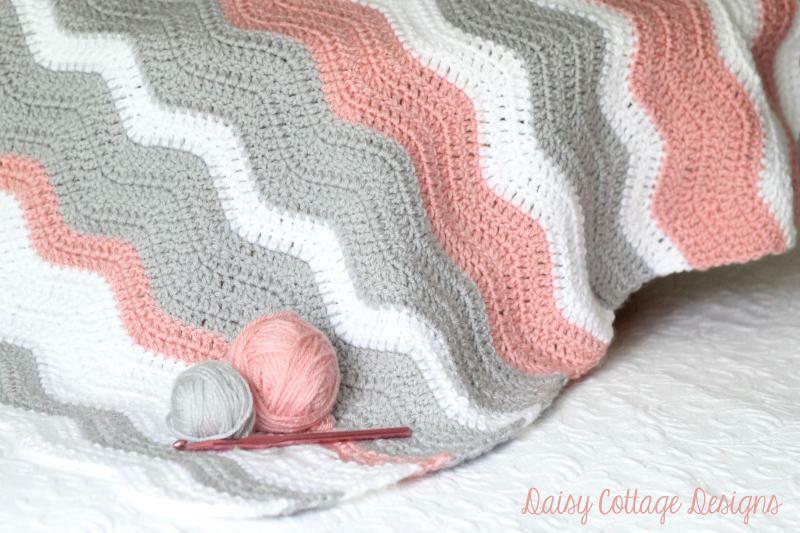 It is an adorable Simple Ripple Baby Blanket… This pattern is by Lauren at Daisy Cottage Designs… If you like this pattern and missed it on Facebook…Click Here to get the free pattern! … On another note… WOW, the Crochet-a-Long projects are looking fantastic!! I am so blessed to see all the beautiful afghans that have been shared… You can hop over to Pinterest to see some of the CAL Pins!! Here is Week 5’s Progress Picture… Week 6 is on the hook… Can’t wait for you to see it!! And a quick shot of the mountain from my work desk… It finally has a little snow! Wednesday Facebook Fan Favorite… Week 35!! Beatrice Ryan Designs 2 Year Blog~Versary!!! Love the colors of yarn in the first photo! I can see Mt. Shasta from my house! Bummer I’m not on Facebook. Oh you must not be to far away! !